TROUTDALE — The Estacada wrestling team held the upper hand most of the way before letting Tualatin slip into the lead late to claim a 42-36 decision in the championship dual of last Friday's Kirk Morey tournament hosted by Reynolds High. The Rangers moved ahead early with Kaiden King (106 pounds) and Faith Grainger (113) each scoring first-round pins. Grainger had Estacada's quickest win of the dual, turning her opponent to his back for a near-fall 45 seconds into the bout. Twenty seconds later, she had him flat for the fall. "We work really hard to get where we are at — it's all about staying strong and being confident," Grainger said. Caleb McDonald (126) countered an early lift to stay on his feet and eventually scored a takedown and a near-fall at the edge of the mat to gain a 4-0 lead at the end of the first period. After riding his opponent for more than a minute, McDonald found an opening and finished the bout with a pin that put Estacada up 18-6 through four bouts. 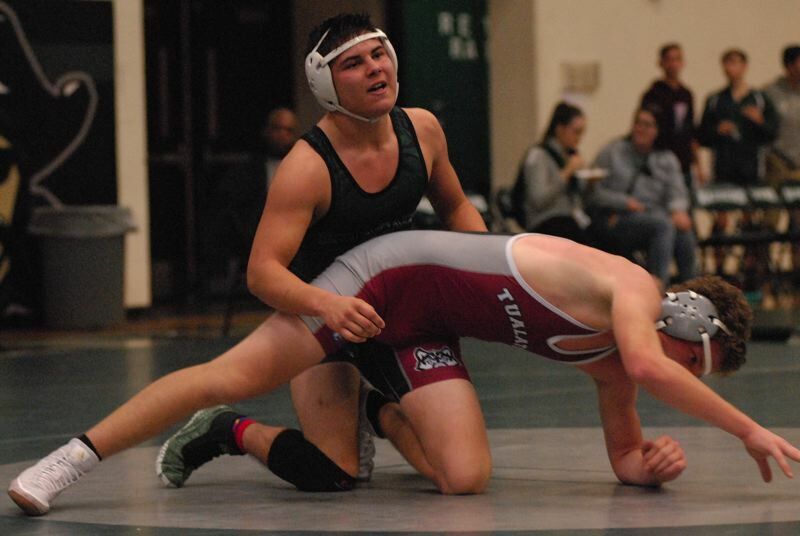 Tualatin tied the team score after receiving a forfeit at 138 pounds, but Estacada regained the lead when Cody Hovda recorded a second-period pin at 145. Tualatin's Noah Brooks won a scramble at the edge of the circle to take a brief 2-0 lead, only to see Hovda respond with a quick escape and takedown. Hovda moved into position for back points with 0:05 left in the first period, but his first attempt came up one arm swing short of scoring. He twisted his opponent once more and got a minor near-fall as the clock went to zeroes for a 5-2 lead after the first period. "I had been working on him the entire period and was able to get the points right before the horn sounded," Hovda said. "That gave me the confidence that I could turn him and go for the pin." He got just that 37 seconds into the second period to put Estacada up 24-18 at the halfway point. "This is great. We lost some seniors last year and weren't sure where we would be, but here we are back in the finals of this tournament," Hovda said. Friday's dual was a rematch of last year's Kirk Morey title showdown. Estacada's Sam Garrison won the most entertaining bout of the evening, as he exchanged the lead four times with Tualatin's Jake Reser at 160 pounds. Garrison led by two heading into the third period, but Reser pulled his leg out of Garrison's grip to finish off a takedown and moved in front 10-9 with about a minute remaining. Garrison slipped loose for a reversal to regain a one-point advantage with 28 seconds left, but Reser managed an escape with 0:13 on the clock to send the bout to overtime. Garrison made the first move in overtime, getting in on his opponent before slipping behind his back for the winning takedown 16 seconds into the extra session. "It's sudden death. You have to give everything you've got. You can't save anything," Garrison said. "I saw his mistake, and I gave it every ounce of energy I had left." Garrison's decision gave Estacada its final lead of the night at 27-24 with five bouts remaining. Tualatin would come up with pins in three of those last five to come away with the dual win. Estacada got a 5-3 decision from Lance Moser at 195 pounds, who earned an escape to tie the score with 1:20 left. His next attack was a shot to the legs that toppled his opponent for the winning takedown. Moser tossed his opponent off his feet to prevent an escape with 40 seconds left, and didn't let his opponent off the mat the rest of the way. Hunter Gotchall beat the buzzer for a pin with 0:03 left in the first round of the heavyweight bout. Estacada reached the championship bout with a 48-33 win over host Reynolds in the semifinals, and the Rangers opened the tournament with a 51-24 win over Franklin. McDonald, Hovda and Gotchall each went 3-0 on the night, winning each of their bouts by fall. Gotchall needed the least amount of time to flatten his foes, spending a total of 4:51 on the mat. Estacada competes at the Molalla Mayhem tournament on Saturday, Dec. 22. This story appears in our Dec. 6, print edition.